When designing your own digital video security camera system, whether it is for residential or commercial use, it is important to make the right choice for the stand alone DVR for security camera. A stand alone DVR or Digital Video Recorder is basically the "brain" of the system that coordinates the functions of the component parts and provides for storage of the digital video files. When designing your own digital video security camera system, whether it is for residential or commercial use, it is important to make the right choice for the stand alone DVR for security camera. A stand alone DVR or Digital Video Recorder is basically the “brain” of the system that coordinates the functions of the component parts and provides for storage of the digital video files. A stand alone DVR for security camera is preferable because it is a self-supportive unit that does not rely on any other additional component (such as a personal computer) and does not require an internet connection. A typical stand alone digital video security system contains one or more digital video cameras, the DVR with a Digital Signal Processor or DSP, and a monitor. The stand alone system works with the stand alone DVR for security camera as the central unit of control. The digital video cameras capture light images, convert them into electronic data, convert the data to binary or digital form and send it to the DVR unit. The DSP in a stand alone DVR is a highly specialized computer processing chip that is made such that it is dedicated mainly toward processing digital data into digital video files. Once the DSP creates the digital video file it may be viewed instantly (live) on a connected monitor and/or saved on the DVR for archiving or later use. One major advantage of using a stand alone DVR for security cameras is that the unit can be placed just about anywhere that power can be supplied to it. Also, there is no risk of computer virus or hacker interference since the internet is not required for the stand alone unit to operate. The DVR itself is basically a very specific type of computer. The DSP receives the data from the digital video cameras and compiles the data into a digital video file (that can be copied and viewed on an ordinary computer as well as the unit’s monitor if attached). The DSP normally uses a COmpression/DECompression or CODEC utility to make the digital video file smaller without a significant loss in quality. Once the file is created, it is stored on the DVRs Hard Disk Drive or HDD. The HDD of a DVR is the same type of HDD that is used in personal computers. Therefore, DVRs are able to reap the benefits of improvement of HDDs originally created for computers. When purchasing a stand alone DVR for security cameras, it is important to purchase the right size (storage capacity) HDD. Digital video files can be incredibly large and require vast amounts of storage space. That’s why the DSP employs the use of a CODEC. However, even then the file size can become quite large in a relatively small amount of time, especially if there are several cameras that are being recorded. The DVR works by storing the digital files in a succession or series. The DVR continues saving the files until the HDD capacity is full. Once the HDD is full, the drive begins re-recording over the original file at the beginning. The larger the drive, the longer the time cycle before re-recording begins. 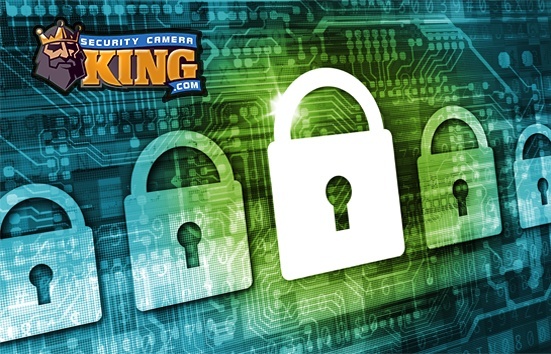 Security Camera King offers HDDs for our DVRs as large as 8 Terabytes in capacity. A stand alone DVR for security camera also can contain additional hardware devices that aid in storage and manipulation of digital video files. For example, many DVRs come with a USB port for connecting a USB thumb drive. Others may also offer the option of a CD/DVD writer. The thumb drive and CD/DVD writers can be used to copy portions of the digital video file to give to police, insurance companies, courts, etc. In addition, the digital video file stored on the DVRs HDD can be copied to DVDs to create a complete archive of all camera recordings. In addition to creating and storing digital video files, the DVR can also provide the means for controlling the cameras. Some cameras have the ability to move horizontally or vertically to increase the field of vision or to optically enlarge an object. These functions are known as Pan-Tilt-Zoom or PTZ and the DVR often contains the programming necessary to control these functions. Check out Security Camera King’s complete line of Elite and Ultimate stand alone DVRs for security cameras. Contact one of our security experts via Live Chat or Telephone if you have any additional questions or would like to make a purchase.